So today we were very lucky, we have glorious weather again, probably about 14 degrees and a clear blue sky. We started off from Ventas and for the first time so far, managed to get eggs for breakfast which was a great start to the day. Today is just a short stretch into Palas de Rei. Although Pat seems to be settling into the routine fairly well, although we have to be careful to take breaks at a time when her painkillers wear off. That gives her a chance to get the walking done whilst the medication is helping her feet and knees. The road is certainly getting a bit busier today. I’ve been reflecting a little bit on this Camino and how it might be very different from my lone Camino last year. It’s certainly is very different in a number of ways, and I don’t mean that in any negative sense. Walking with someone else is certainly the major difference. And perhaps it’s me being rather selfish but having to think of someone else all the time in terms of where to stop, what to eat, speed of walking and so on, isn’t quite the same freedom as just walking on your own. I’ve always thought this Camino was going to be Pat’s Camino. And I’m doing my best to make sure that she enjoys the journey as much as possible. In fact, when I look behind me, about 20 metres behind, with her earphones in, totally zoned out, she’s enjoying the walk. That’s great. The other thing that I think that’s different about this Camino, is the distance. 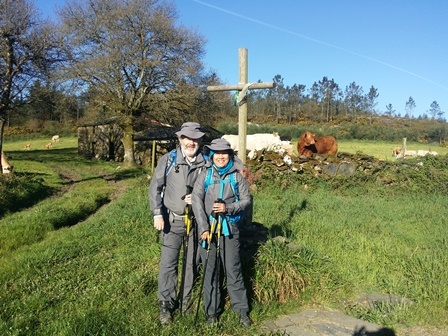 The fact that we started in Sarria, and even though we’re walking very slowly, taking 9 days to reach Santiago, I don’t think it’s really enough time on the road to truly get a sense of what the Camino is all about. 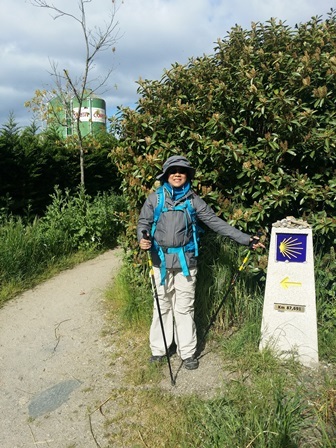 Many people talk about there being three phases on the Camino, the first few days being very physical as you get used to the routine and the long days walking, caring for your body, and particularly your feet. The second phase then is very much a mental phase, keeping yourself going, staying motivated and then the third phase, is what people often refer to as the spiritual phase where you really start to go almost into that meditative state. That’s when the Camino really starts to become, for me at least, at it’s most enjoyable stage. I’m just not sure if you can actually achieve that in a walk of only 9 days. I guess we’ll have to wait and see. I am doing a little bit of planning in the background, in the most unlikely event, that we get to Santiago and Pat wants to walk more. We could quite easily skip down to Portugal and do a short Camino up from there or up to Ferro. But I suspect once we get to Santiago and the journey is done, the rest of our trip around Europe will probably look more affected that more walking. Great stuff you guys, obviously a gastronomic delight. Remember house prices are cheap there – possible retirement option ?